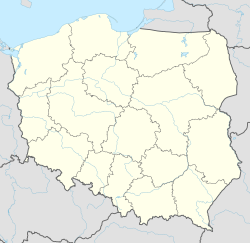 Białogard [bʲaˈwɔɡart] ( listen) (German: Belgard ( listen); Kashubian/Pomeranian: Biôłogard) is a town in Middle Pomerania, northwestern Poland with 24,399 inhabitants (2004). The name is a combination of two Slavic (Pomeranian/Kashubian) terms: biały for white and gard for city/town. The capital of Białogard County in the West Pomeranian Voivodeship since 1999, the town was previously in Koszalin Voivodeship (1950–1998). It is the most important railroad junction of the Middle Pomerania, with two major lines (Kołobrzeg - Piła and Gdańsk - Stargard) crossing there. According to archaeologists the Białogard stronghold was built in the fork of the Parsęta and Leśnica Rivers as early as the 8th century. In the 10th century it was an important centre of long-range international trade at the crossroads of two important trade routes: a north-south "salt route" from Kołobrzeg to Poznań and Greater Poland, and the west-east Pomeranian route from Szczecin to Gdańsk. Pomerania was inhabited by several tribes collectively known as Pomeranians, and Białogard was probably the centre of one of them. In the 10th century Pomerania was conquered by the Polish dukes Mieszko I and Bolesław the Brave, who established a bishopric in the nearby Kołobrzeg in 1000, but the area was soon lost to Poland and Christianity. Białogard is first mentioned in the chronicle of Gallus Anonymous as a rich and populous stronghold in the middle of Pomerania, a famous royal city called white (Alba Regia). This city was conquered by Boleslaus III of Poland in 1107. By the invitation of Bolesław III the Wrymouth and his vassal Wartisław I of Pomerania, Bishop Otto of Bamberg came with a mission to Pomerania in 1124; Białogard was one of the places he visited. In the 12th century Białogard was a seat of a regional governor (castellan). Kashubia was the name of the region around this town. The town developed quickly as one of the more important economic centres of the Duchy of Pomerania, and this was strengthened by the Lübeck law granted to the city by Duke Bogusław IV in 1299. In the 14th century Belgard was a member of the Hanseatic League. As a result of the feudal fragmentation of Pomerania, Belgard was part of Pomerania-Wolgast from 1295 and Pomerania-Stolp from 1368. Duke Wartislaw IV chose Belgard as his main place of residence in 1315. Pomerania was united under Duke Bogislaw X in 1478, after 1569 Belgard was part of the Pomerania-Stettin, and later was again in the united Duchy of Pomerania under Bogislaw XIV, the last Pomeranian duke. Following the Protestant Reformation, the town became Protestant in 1534. After the death of the last Pomeranian Duke in 1637, and as a result of the Thirty Years' War, Pomerania was divided between Sweden and Brandenburg-Prussia in 1648. Belgard with all of Farther Pomerania was assigned to Brandenburg and became part of the Kingdom of Prussia in 1701. In 1724 Belgard was made the capital of a county in the Province of Pomerania, and after the administrative reorganization in 1815, the capital of Landkreis Belgard (Belgard county). The first post office in Belgard was opened in 1825. In 1858 the first railroad connecting Belgard to Köslin (Koszalin) and Schivelbein (Świdwin) was completed; it was extended to Stargard and Neustettin (Szczecinek) in 1878. Belgard became part of the German Empire in 1871. During World War II, the Red Army occupied the town on March 4, 1945. According to an agreement of the Potsdam Conference, after the end of the war the town was put together with Farther Pomerania under Polish administration. In the context of these post-war boundary changes, Białogard (Belgard) became Polish. Its German population was expelled and the town was populated with Poles, many themselves expellees from Polish areas annexed by the Soviet Union. Białogard was made a county city in the Szczecin Voivodeship, was later assigned to Koszalin Voivodeship, and is now located in West Pomeranian Voivodeship. Before the end of World War II the (then German) inhabitants of Belgard were predominantly Protestant. Since the end of the war the majority of the town's population is composed of Catholics. Andrzej Wasilewicz (1951–2016) a Polish stage and film actor and film director. Dariusz Szubert (born 1970) a Polish football coach and former football player. Wikimedia Commons has media related to Białogard. This page was last edited on 7 December 2018, at 09:49 (UTC).